Just a little snip of our February decor. I usually spread a bit more cheer than just decorating the mantel piece, but we are moving soon (hopefully! ), so the flat is a bit out of sorts. Hopefully, next year I will able to do a tablescape and some other bits. The flowers I snagged at Marshalls in the states, on my most recent trip. They were gorgeous and only $13 each... unbelieveable! In fact almost everything on the mantel is from Marshalls. 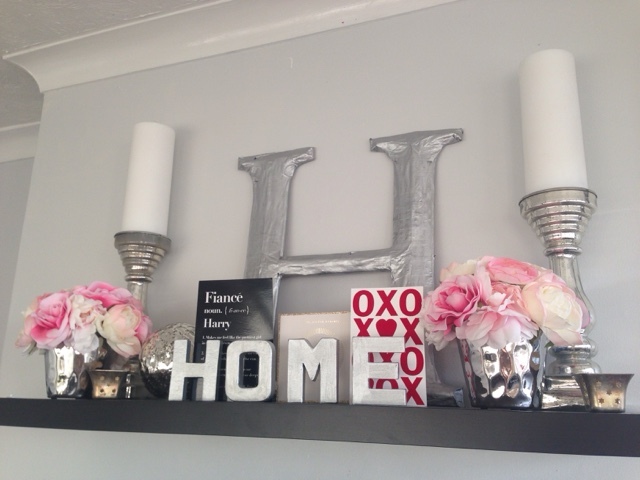 The H was a DIY from a while ago, although not perfect, giant letters can cost a lot and this one cost me nothing. I made it from a giant piece of cardboard, glue, newspaper, and paint. I hope everyone had a Happy Valentine's Day! Much love to everyone!